Never has a cake been so much fun! 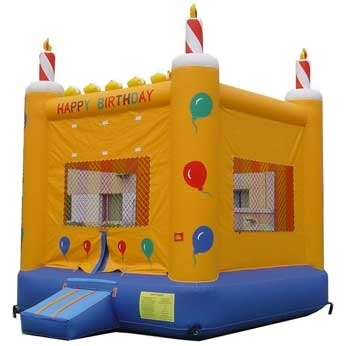 Our Birthday Cake Bounce House inflatable comes in a bright and cheery yellow, with balloons and candles. It’s the perfect choice for a birthday party and is popular amongst the younger children. It features a large, flap entrance and has netted windows on all sides. Fits in well with any themed party or can be used as a central focus for a birthday party.